I recently took up keeping bees and a neighbour asked if we wanted to try taking an unwanted hive from a house he takes care of. The illustrated story (with a little twist at the end) is on imgur. This post describes (roughly) the aims and format of typical systems design interviews, and gives guidance on how to approach them. The intended audience is systems and software engineers who are less familiar with this style of interview. Many companies - large and small - include a "systems design" slot in their on-site interviews, where the candidate is asked to design a relatively large-scale system - typically involving multiple cooperating machines and services. The aim of the company in these interviews is to gauge the candidate's experience with and intuition for the design of distributed systems. It's also a good opportunity to see how well the candidate communicates ideas, and what working with them would be like at a design level. assess the candidate's domain knowledge, problem-solving ability, communications style, and culture fit. Taken together, this is a fairly tall order, so usually interviewers in this area have significant interviewing experience. dig into and solve design issues appropriate to your experience level. Think of yourself throughout as a "future colleague" - taking a collaborative approach to the discussion. You clarify the scope of the problem, asking for any further data you feel you might need to start on the design. You decompose the problem into sub-problems. You start tackling one, again asking for any data not already provided, or deriving new data from what you've been given. The interviewer digs into concrete details, asks for clarifications, and provides hints or further information where necessary. The interviewer wants to understand how you think, so staring at the whiteboard for 5 minutes is not very useful to them. If you usually work in silence, practice on paper before the interview, speaking aloud about what you are doing. If there's a whiteboard - there most probably is - use it for everything. If there isn't, ask for paper. Write down design parameters given to you, or that you derive. Draw system diagrams, data flow diagrams, API specifications. It helps clarify your thinking, encourages useful decomposition of problems, and makes it easier for the interviewer to follow and assess you. Ask lots of questions. You are not expected to be able to just fly this without interacting with your interviewer: treat them as a peer with whom you are working through the design. If you are making an assumption (that you're aware of), state it clearly and ask the interviewer if they'd like you to modify it. Don't attack the problem as a monolith. As soon as you've clarified the initial design parameters with the interviewer, think about the "relatively independent" elements of a system that could meet the design goals and sketch them out on the board. In large-scale designs, this often suggests appropriate (initial) division of the solution into services which can be designed independently, deriving their design parameters from those of the overall problem. Having sketched something, look over it critically and discuss it with your interviewer: is there any major part of the original requirements that you haven't addressed? Anything more loosely or tightly coupled than it should be? Then, you can ask your interviewer which element they'd like you to tackle first. One of the things your interviewer will be looking for is how you handle concrete elements of the design. This is often about e.g. how many machines you are going to need for some sub-service given the design parameters, or what volume of data you expect to have in flight or at rest at any given time. You might enjoy working through "computers are fast" by Julia Evans and Kamal Marhubi to sharpen your intuitions. Back-of-the-envelope calculation like this helps constrain the solution space and gives you a clearer idea of what might work. Note that an estimate can be quite broad and remain useful: your objective is to determine "is this even practical" rather than get (nearly) exact numbers. There are some fundamental things we need to keep in mind when designing a system distributed across multiple machines, and becoming familiar with them should help you navigate the problem domain. Jeff Hodges' notes on distributed systems for young bloods covers many of these and is worth internalizing. My own talk "Designing for Brobdingnag" also looks at building blocks and patterns in large-scale systems design and includes a set of further resources on the last page of notes. Replication and high availability strategies. specific notes you can use to improve. Junior candidates sometimes get wigged out by these interviews and lock up. The failure mode here is expecting too much of yourself: the interviewer knows your experience and background (they've read your CV), so will already have a good idea of the level they can expect. It's their job to appropriately assess the discussion relative to your experience. So do your best, make a good stab at the problem (see "Decomposition" above), try to have a good time, and above all don't compare yourself to an "ideal, more experienced you". At $currentplace we work mostly in Python. We do everything we can to automate away busywork, so we like CI and the family of related tools and ideas. We've put quite a bit of work into a smooth build/test/deploy cycle, and along the way I've spent more time than I care to think of messing about with Python packaging. At Hosted Graphite, most of our deployed services are written in Python, and run across a large installation of Ubuntu Linux hosts. Unfortunately, the Python packaging and deployment ecosystem is something of a tire fire, particularly if your code is in private Git repositories. There are quite a few ways to do it, and not many of them work well. This post tells the story of what we have tried, where we are now, and what we recommend to programmers in a similar situation. Weekly snippets: $project cleanup; meetings & troubleshooting. "Short" week, in that I carried 2 days' work into it. All caught up (down?) now. Updated $otherproject to depend on that, plus Puppet changes to run under supervisor, deployed to $cluster. A frustrating day investigating $protocol issues in $cluster, much excluded but nothing pinpointed. Also some troubleshooting support during an incident on Thursday night - opened $task and updated $doc for followup. Wrote up a plan for $new_project. Discussed $speculative_project ideas with Eman & Charlie. Copious Free Time: started working on Simple ESP Security Association Manager. I write about this here because snippets are brilliant. I love having them to look back over - to find PRs I worked on, or docs I wrote, or when what happened, what I was thinking at a particular time. Without them, I'd be at a loss to explain what I did in any particular month, or would need to reconstruct that from old notes or emails. Writing a retrospective of my first year at the new place - do I get to call it new after a year? - pulled this into focus. Some of my colleagues keep daily snippets. I find that weekly is about the right granularity for me: real nitty-gritty detail is in a notebook I maintain day to day. We've taken to just submitting them to a Github repo, and made a robot to notify us when something's committed so we can follow along. As a remote worker, I need to make it easy for the team to stay in touch with my work, and snippets certainly help. A question that comes up (in this case on #erlang today) is how well lists:reverse/1 performs: when should we reach for another data structure? Because this pattern is so common, lists:reverse/2, which lists:reverse/1 is written in terms of, is a BIF: definition in C (note that a pile of other list functions are defined in C in the same file). This means it should run pretty fast. The Erlang efficiency guide mentions it in the context of tail recursion, but urges us to measure. repeat_tc(M, F, A, N - 1, [Timing | Acc]). 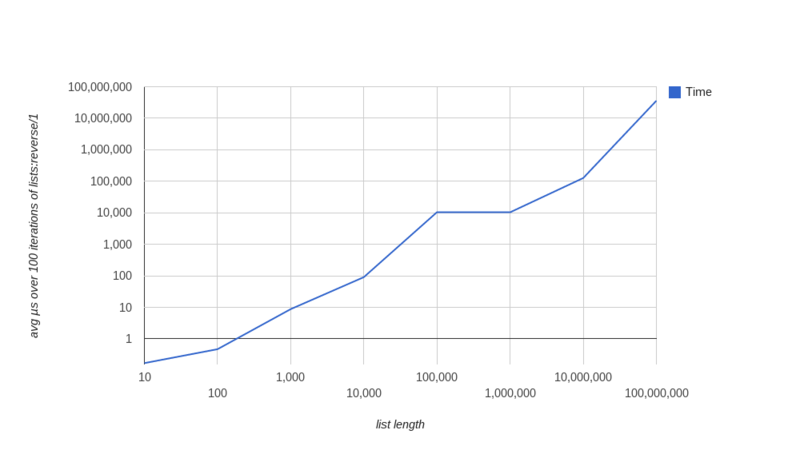 Some log scales here, but as you can see, our list needs to be 100,000 elements before we hit 10ms average on this system: assuming we're doing something interesting when we process each list element, lists:reverse/1 is unlikely to dominate our runtime. Besides, since we mostly work with much smaller lists in real programs, this is definitely in the realm of "don't worry". It's not super-scientific, but the simple answer to when to reach for something other than a list appears to be "not quickly." :o) Good luck, and measure: even naive measurement beats guessing.